Chabad. 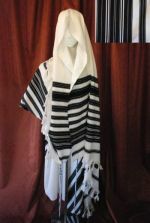 The origional prayer shawl. Used by the ultra religious. Unbleached, Silk lined. The best quality. Cream and Black prayer shawl. Colour: Cream and Black with Silk lining. Fits larger sizes. Ideal for extra large build.